Undated photos of Witt released by the FBI. Monica Elfriede Witt, a former counterintelligence officer with the U.S. Air Force, has been charged with giving the Iranian government classified information in an indictment unsealed today. The U.S. Department of Justice (DOJ) says that information provided by Witt aided Iranian hackers in a phishing campaign directed against her former colleagues in the American intelligence community. The DOJ claims that Witt was given computer equipment and housing accommodations by the Iranian regime in exchange for her cooperation in mounting a campaign against U.S. intelligence. She also allegedly used her knowledge of the U.S. intelligence community to help Iranian hackers target other Americans with spyware. In one such instance, the Cyber Conspirators created a Facebook account that purported to belong to a [U.S. Intelligence Community] employee and former colleague of Witt, and which utilized legitimate information and photos from the [U.S. Intelligence Community] employee’s actual Facebook account. This particular fake account caused several of Witt’s former colleagues to accept “friend” requests. But Witt wasn’t the only one charged today. The DOJ is also charging the Iranian hackers she allegedly worked with. “Four Iranian cyber hackers are also charged with various computer crimes targeting members of the U.S. intelligence community who were Ms. Witt’s former colleagues,” Assistant Attorney General John Demers said in a statement. Witt also popped up in a story published by Iranian state media in June of 2016. The article includes a photo of Witt converting to Islam from Christianity and says that Witt participated in the Occupy Wall Street protests of the early 2010s. That timeline would match up with Witt’s departure from the American defense community in 2010. Needless to say, the intelligence community is not happy with Witt’s alleged betrayal. 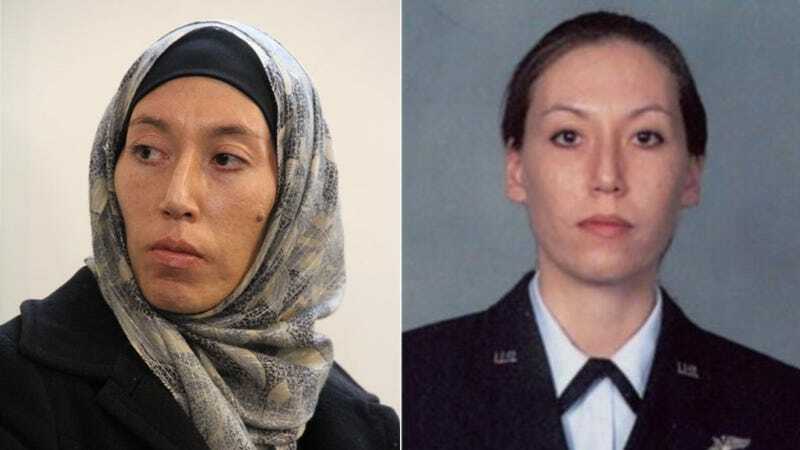 “The alleged actions of Monica Witt in assisting a hostile nation are a betrayal of our nation’s security, our military, and the American people,” Special Agent Terry Phillips of the Air Force Office of Special Investigations said in a statement.